BERLIN — Kant Strasse in this city’s Charlottenburg district is a bustling business street lined with shops, small hotels, department stores, and restaurants of all types, including Thai, Russian, Vietnamese, Chinese, Italian, Pakistani, and of course traditional German places. Some places mix it up with curry wurst, a favorite up and down this boulevard. 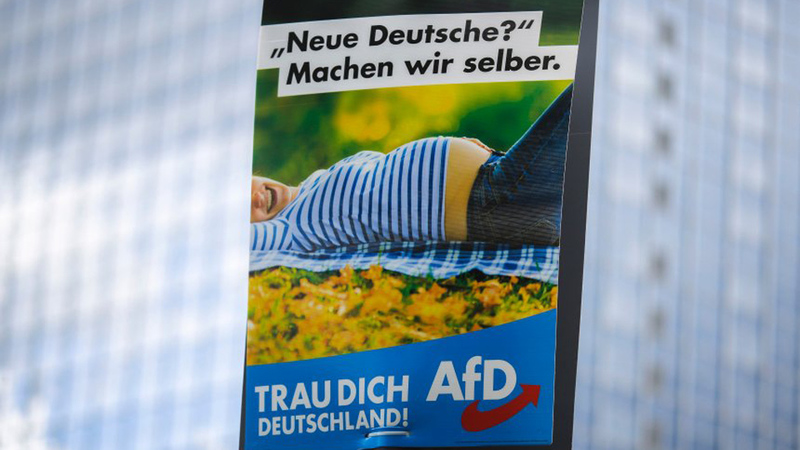 It’s a campaign poster for the extreme right, anti-immigrant Alternative for Germany (AfD) party. The national elections in Germany will be held on Sept. 24. German voters, like voters in France, the Netherlands, and Austria, are expected to hand the extreme right a defeat, but it is not total numerical victory that the AfD is looking for in this election. 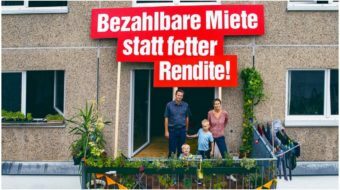 They are happy that they have already curbed the willingness of the two major parties, the Christian Democratic Union (CDU) and the Social Democrats (SPD), to challenge them on their anti-immigrant hatemongering. Beyond that, they hope to become the main opposition party by capturing enough parliament seats to place third in the Bundestag behind the two dominant parties, who have ruled together in a “Grand Coalition” since 2013. Right now there are four parties vying for the third place spot, each with close to 10 percent in recent polls. They are the Left Party (Die Linke), the Greens, the Free Democratic Party (FDP), and AfD itself. In polls that came out today, the Left Party was only one point ahead of AfD. When Germans go to the polls on Sept. 24 they will cast two votes—one for the person they want to represent them in the Bundestag and the other for the party of their choice. Half the 600 members of the Bundestag will be the representatives selected directly by voters, and the other half will be chosen proportionately according to the votes the various parties achieve. To gain one of those seats, however, a party must obtain at least five percent of the vote. You get to be chancellor if you are the leader of the party that gets the most votes or, short of that, the leader who is able to put together a governing majority. For years now, the CDU has had a support base in the mid to high 30s, the SPD in the low 20s, and the other four parties have hovered around 10 percent. Chancellor Angela Merkel first took office in 2005 as head of a Grand Coalition with the SPD, after neither of the two parties gained an outright majority in elections. From 2009 to 2013, she ruled in alliance with the right-wing Free Democrats, but returned to leading another CDU-SPD Grand Coalition from 2013 to now. The center-left SPD has seen its support decline nationally due its partnership with Merkel. The party was widely seen as having sold out on many issues to Merkel’s conservative CDU. As part of the Merkel cabinet, the SPD also had to share blame for government efforts to raise the age for pension eligibility, place restrictions on collection of jobless benefits, and cut social benefits, as well as for its support of military interventions opposed by many Germans. In two states, Berlin and Thuringia, however, the SPD rejected the Grand Coalition, and instead chose to form coalitions with the Left Party and the Greens. In both those cases, the result was the formation of winning “red-red-green” coalitions, in reference to the colors of the three participating parties. Some still hold out hope that after Sept. 24 a similar arrangement might happen on a national level. In order for that to happen, however, the SPD, the Left Party, and the Greens together would have to gain a majority of seats in the Bundestag. If the CDU and the Free Democrats together can gain more than half the seats, Merkel could ditch her SPD partners and instead form a coalition with the fringe right wing. The 2009-13 CDU-FDP coalition fell apart in the last election after the FDP failed to get enough votes to even be represented in the Bundestag. That’s when Merkel had to return to the SPD to form a governing majority. 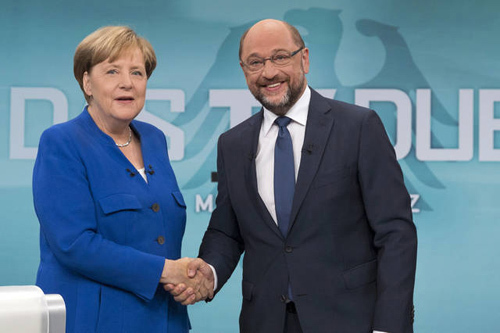 The SPD leader this time around, Martin Schulz, started out neck-and-neck with Markel in the polls when he announced his candidacy last February. 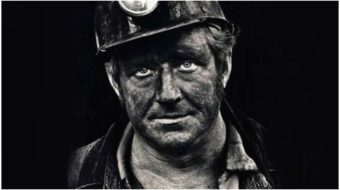 He had put himself forward as someone committed to returning the SPD to its role as a fighter for working-class interests. Since then, however, he has fallen 13 points behind Merkel in the polls. The recent televised debate between the two probably helps explains why. Both showed that they are afraid to tackle head on the anti-immigrant hysteria whipped up by both the AfD and right-wingers in Merkel’s own CDU. 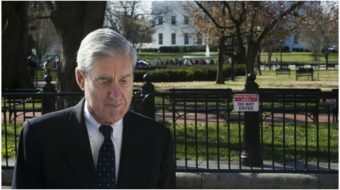 Both politely agreed that immigrants guilty of “crimes” should be deported, and neither wanted to talk about immigration much more than that. In short, judging by their “debate,” the two main candidates are not offering voters much of a choice. Schulz, dismayed that his TV appearance yielded no change in his dismal poll results, today offered to debate Merkel again. Comfortably ahead, she scoffed at the suggestion and said the one debate was enough. Not only has the party defended the rights of immigrants, it has also vigorously called for higher wages for all Germans. It has campaigned hard against the policies of the real estate industry and the devastating effects of gentrification in the cities. It is the only party that says unequivocally that it is opposed to the deployment of German troops anywhere overseas, including not just in Afghanistan but also any UN operations. At its convention this spring, the party discussed warnings from the SPD and others that this position could be a deal-breaker for any potential national coalition with the Left Party. 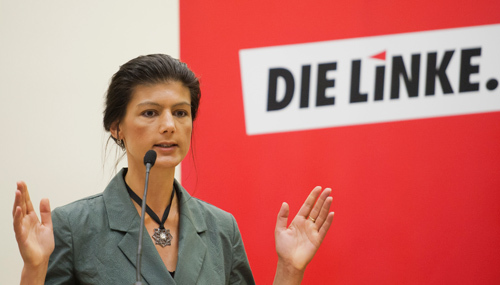 Dr. Sahra Wagenknecht, the Left Party’s leader in the Bundestag, made an impassioned speech. “It is the other parties that must come around to our position on ending German militarism,” she declared. “For us, there is no compromise on this that is possible.” She received a standing ovation so strong and prolonged that it was seen as unifying the party on this issue. It remains a unifying factor even as party members differ on numerous other issues. While most of the country’s unions give at least tacit support to the SPD, many members of unions that represent teachers and government workers are actively supporting Left Party candidates. There are a host of other minor parties in the race too. The Communist Party of Germany, which has usually supported Left Party candidates, decided this year to run its own. There was disagreement on this among the membership, but the prevailing idea was that the Left Party was too focused on elections and not enough on fighting on the issues. A variety of tinier parties are not expected to make much difference. 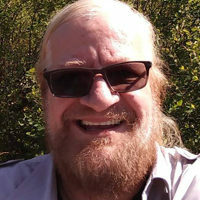 They include a Maoist party, a Trotskyist party, an animal rights party, a climate party, a hip-hop party, and a “garden” party run by the wife of the right-wing U.S. political extremist, Lyndon LaRouche.